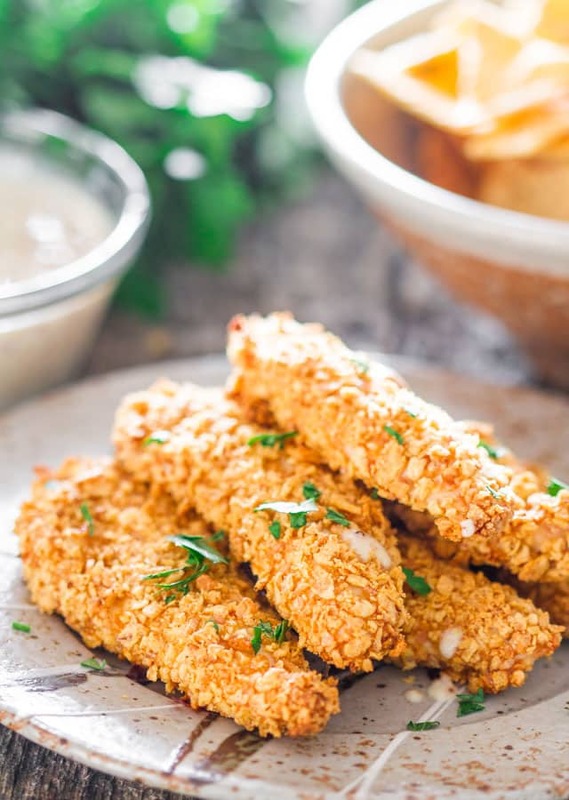 Oven Fried Breaded Chicken Tenders with Maple Mustard Dipping Sauce – a simple recipe for delicious crispy baked chicken tenders. I remember a few months back, a friend and I went for lunch and she was so excited to take me to this fried chicken place, she kept insisting how it was the best fried chicken ever. So I agreed and off we went and had some fried chicken. Well, I was not impressed at all; the chicken was super greasy and heavy and I literally felt sick after. This is why I prefer to “oven fry” or bake my chicken. 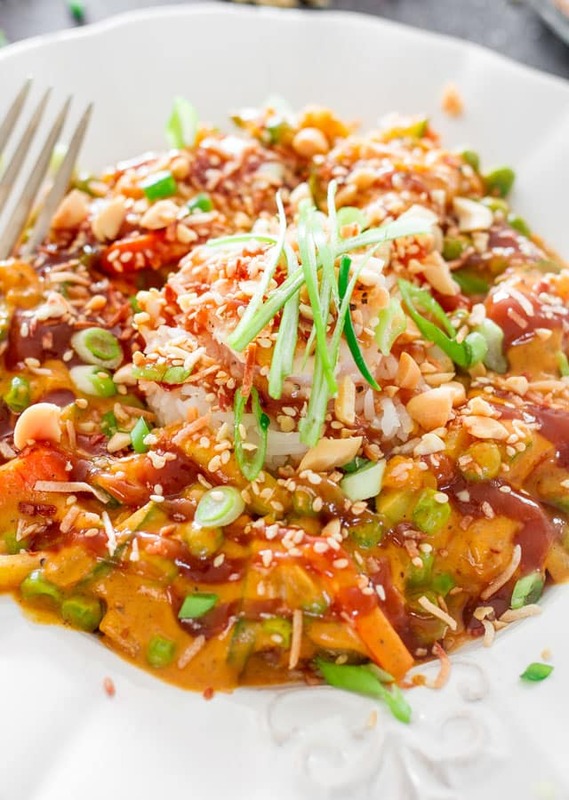 Without sacrificing on taste, you always end up with great crispy and flavorful chicken. So today I’ve got a super easy recipe for you to make super crispy chicken. 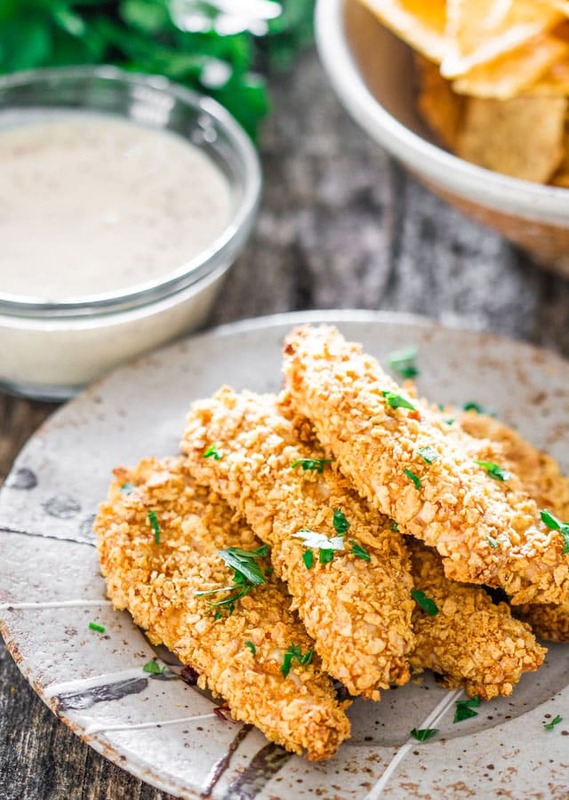 These yummy chicken tenders are generously breaded with Pepperidge Farm® Cracker Chips crumbs, turning them into the most crispiest chicken ever! I also made a simple maple mustard sauce for dipping your chicken. I used Cracker Chips, specifically the Savoury Multigrain ones, and I turned them into crumbs in my trusted old food processor. 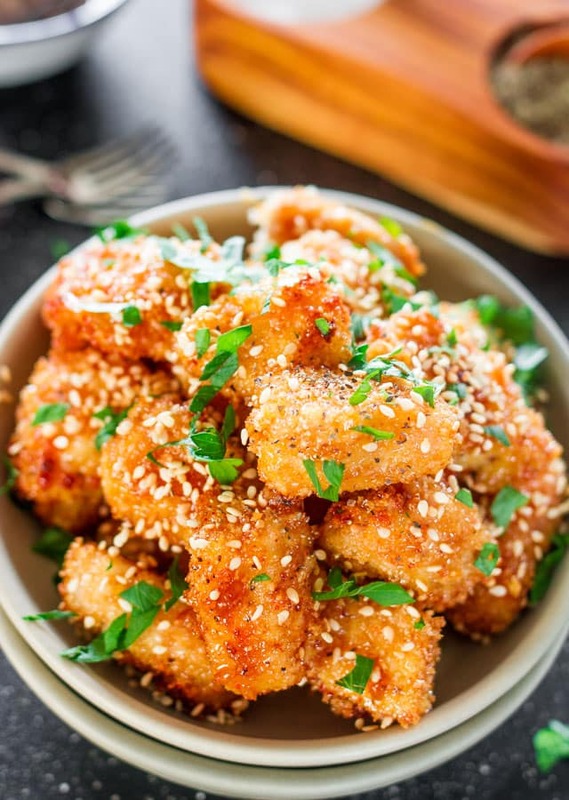 They’re so yummy and flavorful that you don’t really need a lot of seasoning for your chicken, though I still seasoned my chicken tenders with just a bit of salt and pepper. Then all you have to do is dredge the chicken tenders in some egg, then in the Cracker Chip crumbs and bake them. I know some of you may wonder if you can fry them and of course you can, totally up to you, but I baked mine for about 30 to 35 minutes at 375 F degrees and you seriously end up with super crispy chicken. The maple mustard dipping sauce I made is really easy to make, all you need are 3 ingredients: maple syrup, mustard, and plain yogurt. And that’s it. Really easy, right? Now you know my secret to oven “fried” crispy chicken. You can also use chicken breast, chicken thighs, even chicken drumsticks. No matter what, you’ll always enjoy crispy chicken. 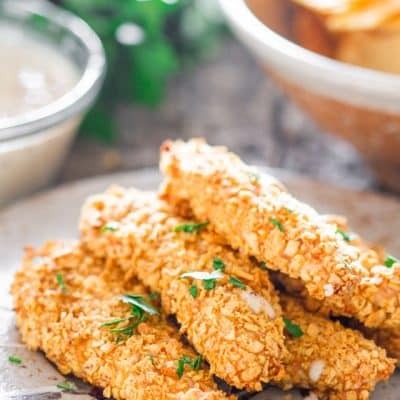 Oven Fried Breaded Chicken Tenders with Maple Mustard Dipping Sauce - a simple recipe for delicious crispy baked chicken tenders. Lightly season chicken tenders with salt and pepper. Add Cracker Chips to a food processor and pulse until fine crumbs form. Pour Cracker Chip crumbs onto a shallow plate. In another shallow plate beat one egg. 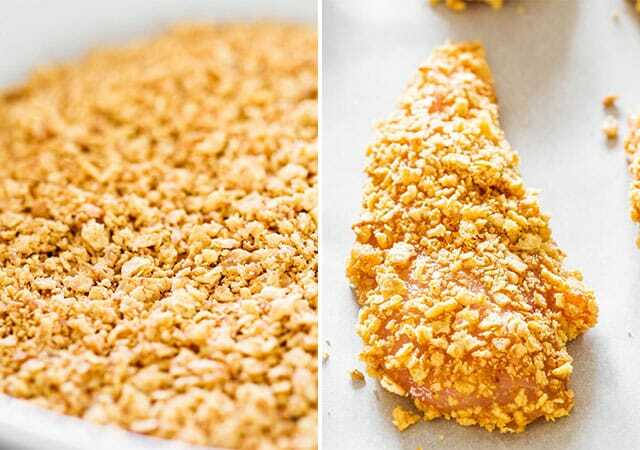 Dip chicken tenders first in egg then in Cracker Chip crumbs making sure they're fully covered in crumbs. Place on prepared baking sheet. Bake around 25 to 30 minutes or until golden brown and chicken is cooked through. While chicken is baking whisk all the ingredients for the dipping sauce in a small bowl. 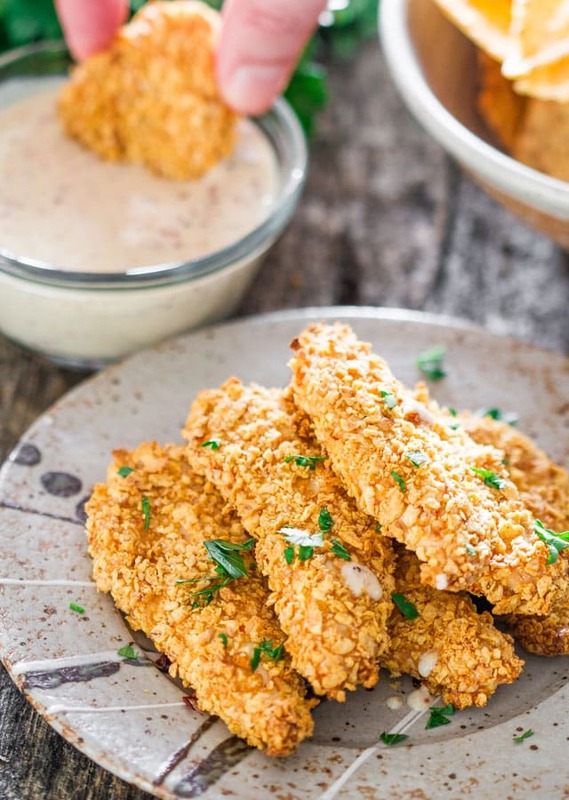 Serve chicken tenders with maple mustard dipping sauce. 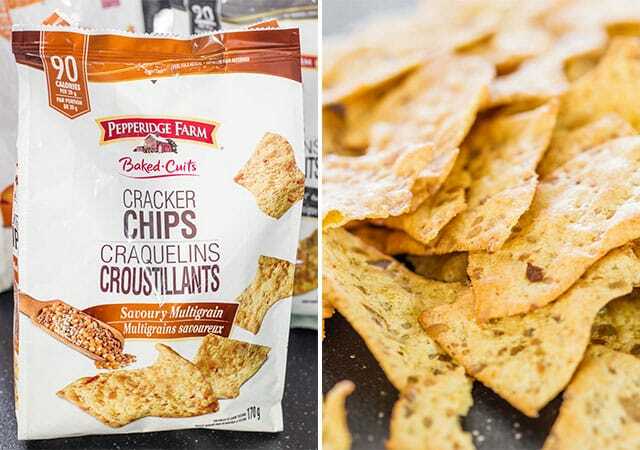 Here’s a coupon for $1.00 off any package of Pepperidge Farm® Cracker Chips, enjoy! Hi, I live in New Zealand and don’t have that brand of chip here. 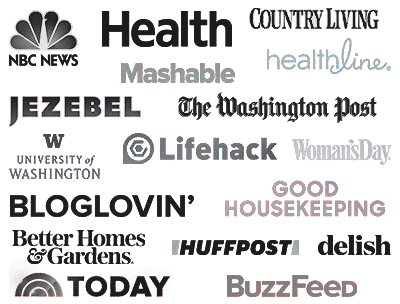 What would you recommend I use instead? You know what would work great? Cereal like cornflakes, they would make the chicken really nice and crispy. Hi Jo! I am already a blind fan of your blog! This one has killed me again, surely gonna try this soon! Mustard, maple syrup & greek yogurt?! So darn smart. This chicken looks perfectly crispy and I love that there’s no grease! I can imagine the biscuits create an awesome seasoned crust! I love this, it’s a fantastic shortcut. 🙂 We don’t have that brand of biscuits here but I can think of suitable substitutions! Love the dip too. Adding it to my staples! Definitely, hope you try it! These look so enticing and I was mesmerized by Nagi’s recipe too. Brilliant effort and thanks for sharing. what do use instead of your crackers? 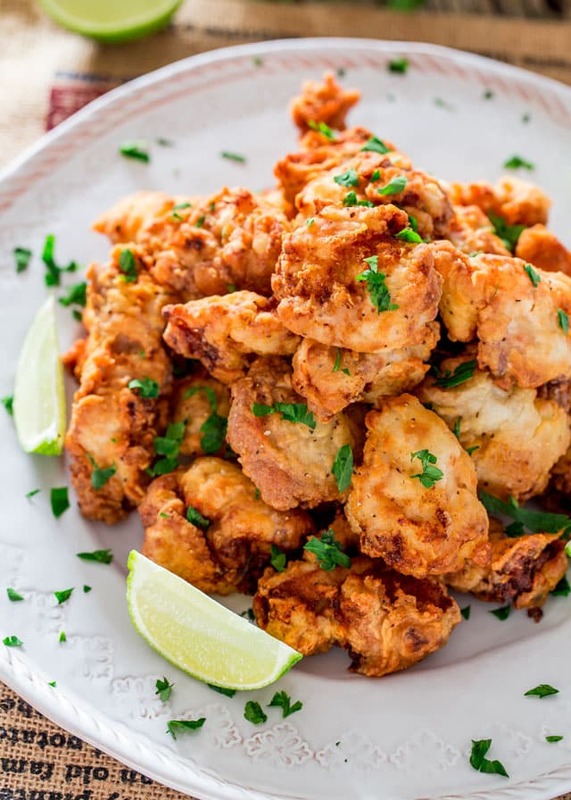 Thanks for this great recipe… watched recent show on tenders-FRIED, and we now have 3 new fast food locations, again all with FRIED. With my commitment to living a long and healthy life, I’m most interested in BAKING my tenders. 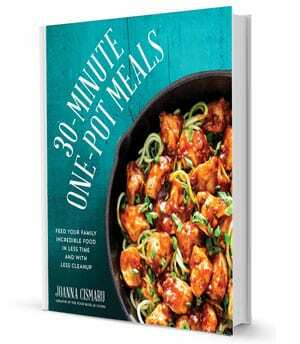 Your timing is the best- will use lowest sodium crackers I can find! You’re awesome- with a bit of ‘psychic’ thrown in! Such a great use of these cracker chips! 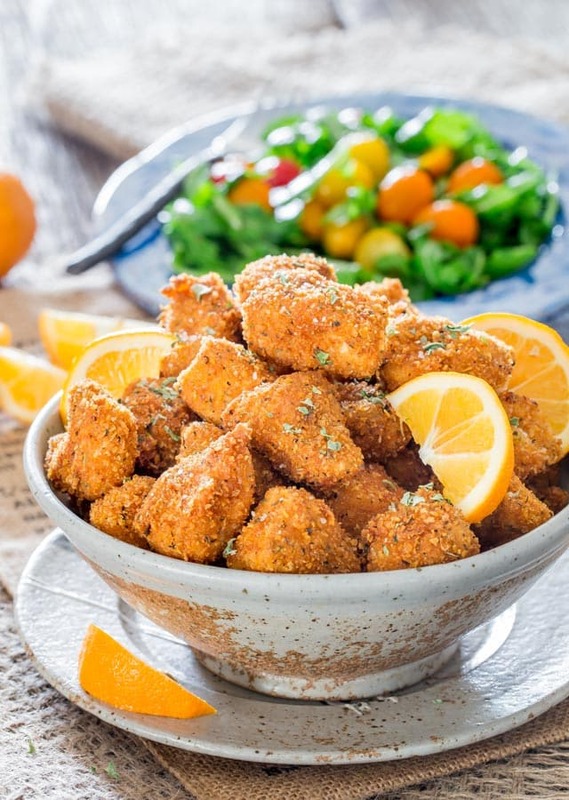 I always bake my chicken tenders too — love this new idea!